Hi there! 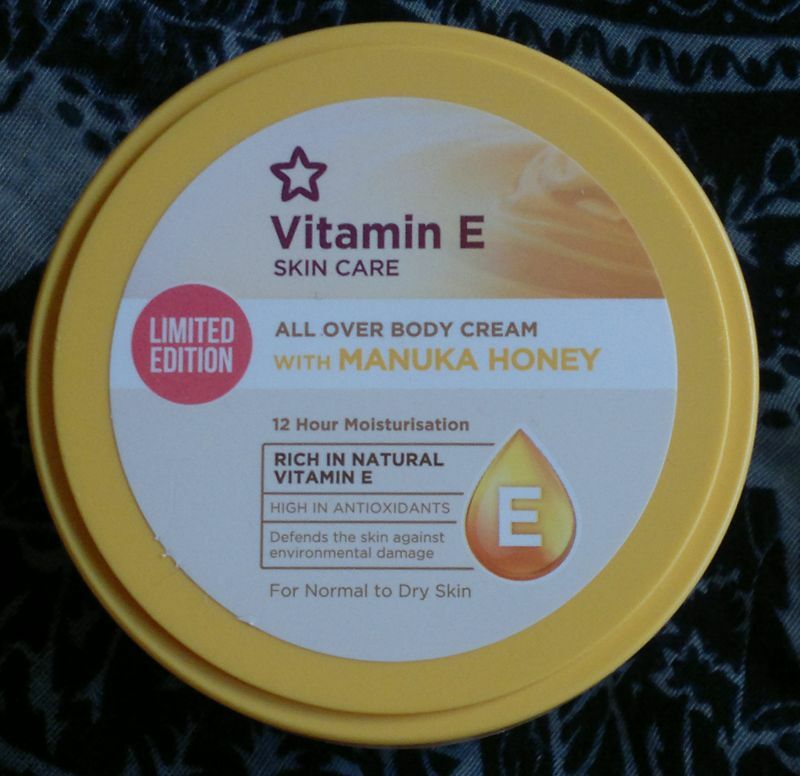 Today’s post is about Superdrug’s Vitamin E Skin Care All Over Body Cream With Manuka Honey. This cream is a limited edition – so I bought two tubs when they ran a ‘buy one, get second half price’ promotion about two weeks ago. First of all, this cream smells very nice. I’d describe the scent as exotic and warm. The coconut oil in this product is quite noticeable. But (as someone who doesn’t like the scent or taste of coconuts) let me assure you this cream doesn’t have this overpoweringly sweet and dense fragrance which many coconut products have. This cream smells lovely, and – judging by its scent – you’d think it’s a high-end product! I think this body cream is really good. It feels rich and moisturising, and it takes care of dry skin. I’d even say it’s calming! And despite the rich formula, this cream doesn’t feel sticky at all after a few minutes. I love it! And if it wasn’t a limited edition, I’d say this cream could become a beauty staple! Superdrug’s Vitamin E Skin Care All Over Body Cream With Manuka Honey (limited edition) is available as 475ml for £2.99. Very good value! The product carries the Leaping Bunny logo – it’s cruelty-free and suitable for vegetarians! Hi there! I’m trying to bring some order into my beauty stash – and I found quite a few Essence single eyeshadows which I’ve never used. 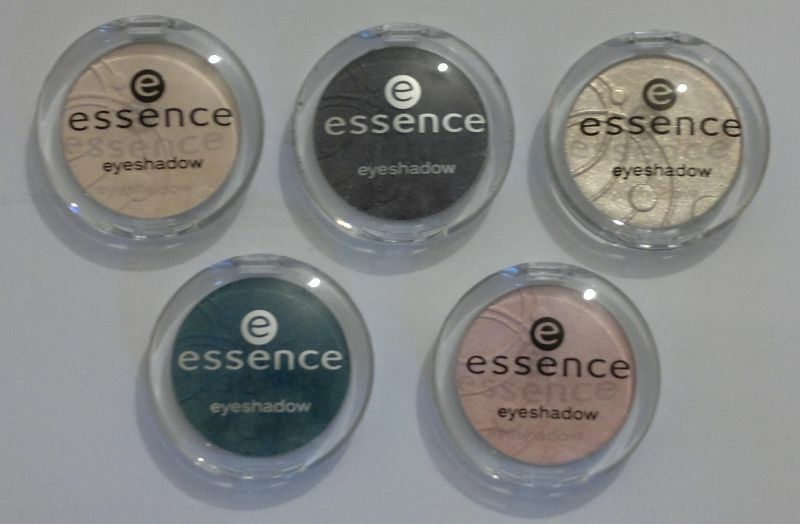 Now that I’ve found them, I do remember buying them when they were 50p each – that was when Essence revamped their eyeshadow collection about a year ago (?). I’ve now tried these eyeshadows – and I think they’re great. They’re even softer and more buttery than Sleek or MakeUp Revolution eyeshadows (I’m totally thrown – but in a good way!). And they’re highly pigmented. I swatched these five eyeshadows in the same order as they’re in the picture above: 78 Vanilla Milkshake (shimmery vanilla), 80 Groovy Grapes (dusty purple), 02 Dance All Night (sparkly gold), 79 Lola Petrola (petrol / teal), 68 Strawberry Ice Cream (shimmery baby pink). These eyeshadows are extremely nice! Groovy Grapes and Lola Petrola look a bit weak in the photo, but they’re really great in real life. 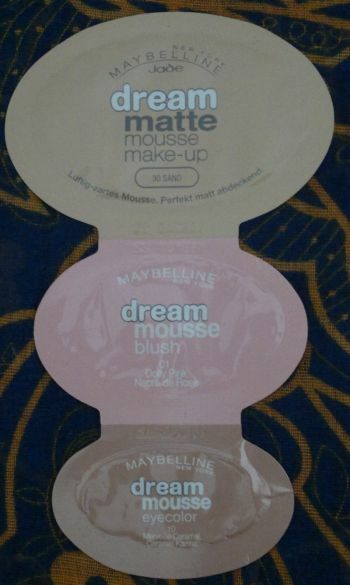 The three shimmers look a bit pale in the pictures – but that’s because of my pale arms. 🙂 Anyway, the eyeshadows are easily blendable and they don’t give me any trouble at all. So yes, I’d definitely recommend them! I’ve got a few more of these to try and wear – and I’ll report back on the remaining eyeshadows shortly. In the meantime, if you’re interested in Essence cosmetics, you can find their products at Wilko. 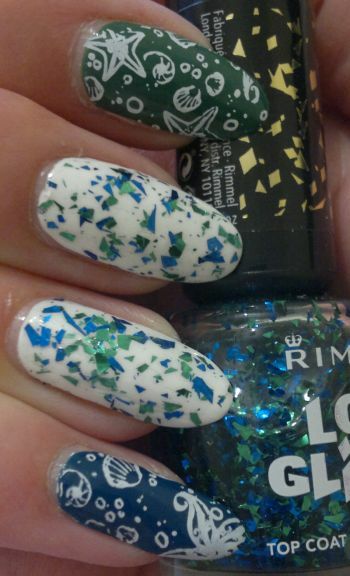 If you’re into nail stamping, you should try Essence’s white stamping polish which is £1.49 only! I Love… Strawberries & Cream Bath and Shower Cream (available as 500ml) is a gentle bath and shower product. I wouldn’t say it’s moisturising, but it’s certainly not drying. The strawberries & cream fragrance is very sweet! I Love… Strawberries & Cream Body Butter (available as 200ml) is a reasonable moisturiser. It’s not as thick as many other comparable body butters, so it’s a bit easier to apply. But it isn’t as rich as those thick body butters. Still, it’s definitely a good product! The strawberries & cream scent is sweet, intense and longlasting. I Love… Strawberries & Cream Body Spritzer (available as 100ml) really is the cat’s whiskers – if you’re into strawberry-scented body sprays. On its own this body spritzer isn’t that longlasting (which is OK). But if you spray it on after you’ve used the matching body butter, you’ll be surrounded by the sweet aromas of strawberries & cream for hours – probably even half a day. I think that’s fairly impressive! I’m not the biggest fan of super sweet scents in toiletries. So I’ll be giving the body spritzer and the bath and shower cream away. I’ll use up the body butter myself (my fingers have been in the tub, so I wouldn’t want to give this one away). But my teenage relative will surely be happy to take the other two products off my hands. 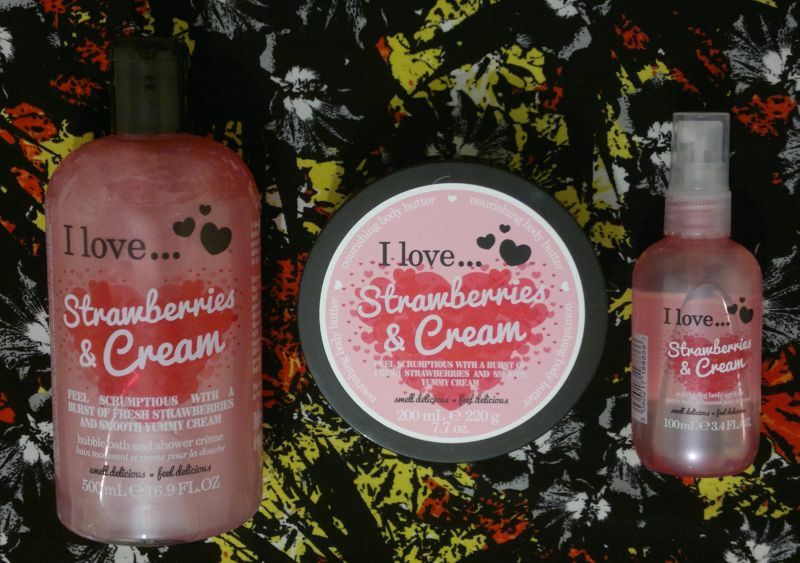 Saying this, if you’re a fan of strawberry-scented toiletries, I would definitely recommend this I Love… collection. The strawberries & cream fragrance is sweet, intense and much more authentic than some high street brands’ (more expensive) strawberry-scented offerings. The I Love… Strawberries & Cream product line has been updated – the design of the packaging has changed and some products might be replaced. However, the price seems to have remained the same – most I Love… products are still £2.99. Hi there! 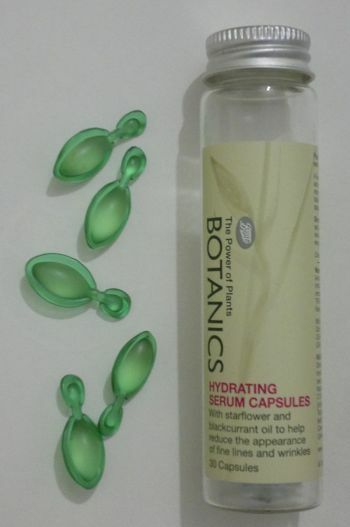 When I had a bit of a clear-out recently, I found these Boots Botanics Hydrating Serum Capsules. It’s been a while since I actually used these serum capsules. But I remember I liked them, so I decided to give them another try. 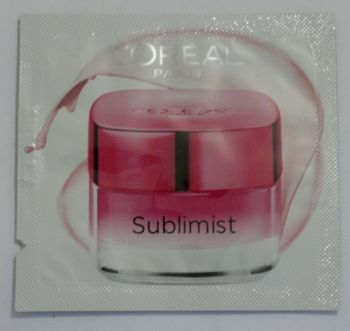 For the past few days I’ve used the serum on my face (once daily, in the morning, before I applied my day moisturiser). And I’m really pleased with the product! The serum feels wonderfully velvety. I love it! And it really does give my skin a moisture boost – just what I needed! And despite the rich formula, the serum doesn’t mess with my make-up! I’ve previously used other Boots Botanics products as well – but only stuff from the older collection. But now I really want to look into the current product line! Any recommendations?